Now Available, RevMax includes the TJ Pro in one award winning unit. The Throttle Jockey RevMax is an RPM limiter. It allows the pilot to maximize the power from the engine whilst preventing over speeding. 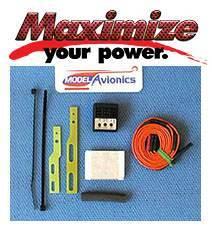 RevMax allows normal throttle signals from the receiver to pass directly to the throttle servo under most conditions. This is done anytime that the engine rpm is the same as or lower than the target rpm. When an over speed condition is detected, RevMax enters a governor mode and controls the throttle servo. The target RPM is set by an auxiliary channel. RevMax does not require a super servo. Stable up to 10 volts. The Rev-Max is a new concept. This unit differs from the usual engine governor and may be coined an "RPM limiter", or as industry often terms an "Over-speed Governor"
The Rev-Max does not govern an under-speed condition relying solely on the throttle curve for this function. The problem with all governors is a slight throttle lag. This issue has been completely addressed with this product. The Rev-Max deals with less than half the workload during engine rpm management thus allowing for a better and direct connection between the engine and rotor. When the limiter is not needed it is completely by-passed. As an example, during rapid tic-tocs this unit will supply more useable power to the rotor at the ideal time resulting in a faster, stronger and more impressive maneuver. The throttle simply stays in sync with the rapidly changing rotor loading. Fast multiple rolls benefit in a similar manner as do others. Tuning the throttle curve is fairly straight forward after selecting a target rpm on the ground using the lower point on the current curve. This verifies that the unit is clipping at the desired rpm. Once this is completed the rest of the idle-up points are set in flight to maintain or slightly exceed the target rpm. The engine note will give ample under-speed clues since confusing over-speeding is non-existent. Cyclic to throttle mixing will now co-exist with the Rev-Max and can be set in flight to remove any under-speeding during hard over cyclic maneuvers. A direct and very connected feel is maintained with no over reving of the engine or rotor. The Rev-Max will not easily mask a poor mixture setting as a governor might, and will encourage smoother and more available engine power. With the smaller 30 and 50 sized governed machines the extra useable power is most welcome. Competition pilots have always wanted a direct link between the throttle and rotor but had to put up with annoying over speeding. This is because different maneuvers load the rotor differently at similar collective settings. Many flying the bigger helicopters presently employ a governor to this end as the lesser of two evils, while hard-core stubborn perfectionists refuse to have any part of a governor. Today we have the cure for both. "The Rev Max limiter works better then any governor on the market today, superior midrange power is achieved resulting in a more positive feeling model. This is the only rpm limiter on the market that I know of, it's very good idea which allows one to get even more performance out of their helicopter."